When it comes to the best destinations in the Philippines, there are few places more iconic than the region of Palawan. 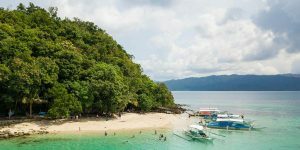 In fact, those looking for things to do in Palawan Philippines will discover some of the most unforgettable landscapes and beaches in the world. Palawan, a long-thin series of islands that reaches between the Philippine island of Mindoro and the country of Brunei is exploding with unique wildlife and stunning scenery. 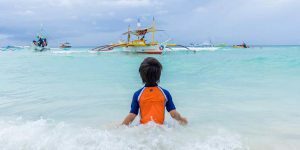 For anyone traveling to the Philippines with kids, looking for the best things to do in Palawan should be at the top of your list. Our family traveled through Palawan and it was magical. From the popular marine parks of El Nido to the quiet beaches of San Vicente and over to the stunning scenery of Coron, we were met with unforgettable experiences along the way. And while this huge archipelago can be difficult to navigate, it is without a doubt one of the most incredible places to visit in the Philippines. Palawan is an island archipelago that branches out from the rest of the Philippines. The Palawan Islands stretch from the center of the country down towards the south on the east side breaking the South China Sea from the Sulu Sea. Palawan is comprised of around 1,780 islands and small islets spread from Busuanga in the north to Balabac in the south. If you travel to Palawan it’s important to take travel time into consideration. The island landscapes are mountainous, so the road trips in Palawan are long and windy. And if you are traveling by boat in Palawan it can take quite a bit of time, especially if the weather isn’t ideal. 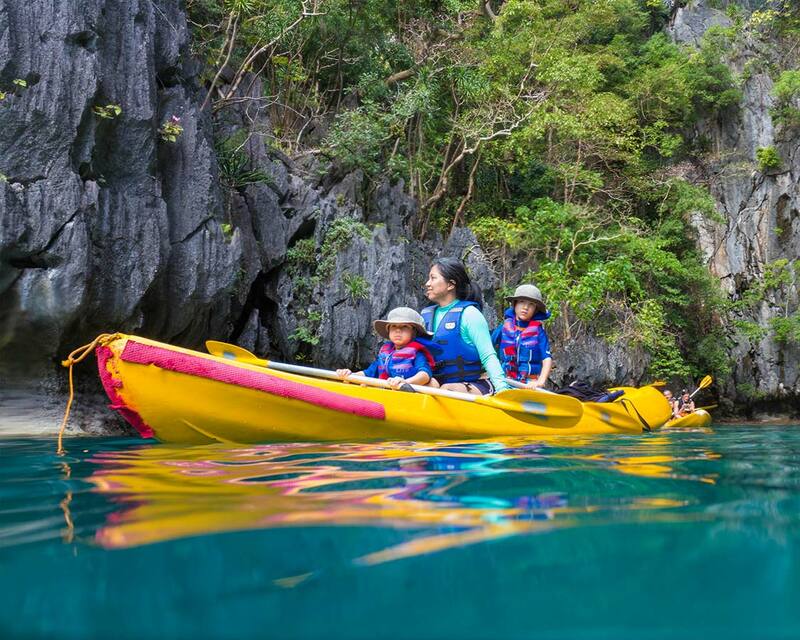 If your plan for family holidays include island hopping in Palawan with kids, be aware that most boats and tour companies do not stock life jackets for young children. If you have young children we highly recommend that you bring one with you to the Philippines. We use this model and highly recommend it. If you are spending only 2 or 3 days in Palawan it’s best to choose one destination and experience it. Whether you choose Puerto Princesa or Coron, you won’t be disappointed and you will get a chance to experience the best of that region. 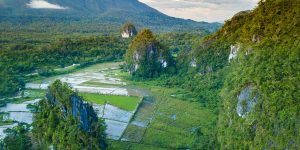 But if you have a week in Palawan or more, you’ll have an opportunity to hop around and see some of the most exciting areas throughout the region. Most people who travel to Palawan first arrive in the capital Puerto Princesa. While at first glance, Puerto Princesa Palawan is a big city that’s the center of hustle in the region, those who spend a few days in Puerto Princesa will realize that there are many incredible things to do in Puerto Princesa. Puerto Princesa is home to one of the 7 natural wonders of the world, the incredible Puerto Princesa Underground River. This is the 2nd longest underground river in the world. And beyond the caves, Puerto Princesa has beautiful beaches, wonderful island hopping in Honda Bay, and incredibly fun and cultural attractions like Mitra’s Ranch and Bakers Hill. Puerto Princesa Philippines also has amazing attractions for adventurous families. 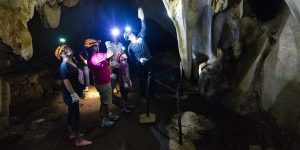 Things to do in Puerto Princesa such as Ugong Rock Cave Adventures and Hundred Caves make for thrilling day trips from the city. Puerto Princesa is the gateway for all the things to do in Palawan for families. So visiting here is convenient as you’ll likely already be passing through. Although Puerto Princesa is a big city, it’s got a load of great restaurants and excellent resort-style accommodations. It’s also very easy to use Puerto Princesa as a home base for big Palawan attractions like Honda Bay tours and the Puerto Princesa Underground River. Spending a half-day exploring Puerto Princesa City is really all you need. After that, spend the afternoon on the beach by island hopping in Honda Bay. If you plan on visiting the Puerto Princesa Cave systems like the Underground River, head to Sabang and stay at one of the beachfront properties. You’ll be walking distance to the Underground River tours and the pace is much slower. 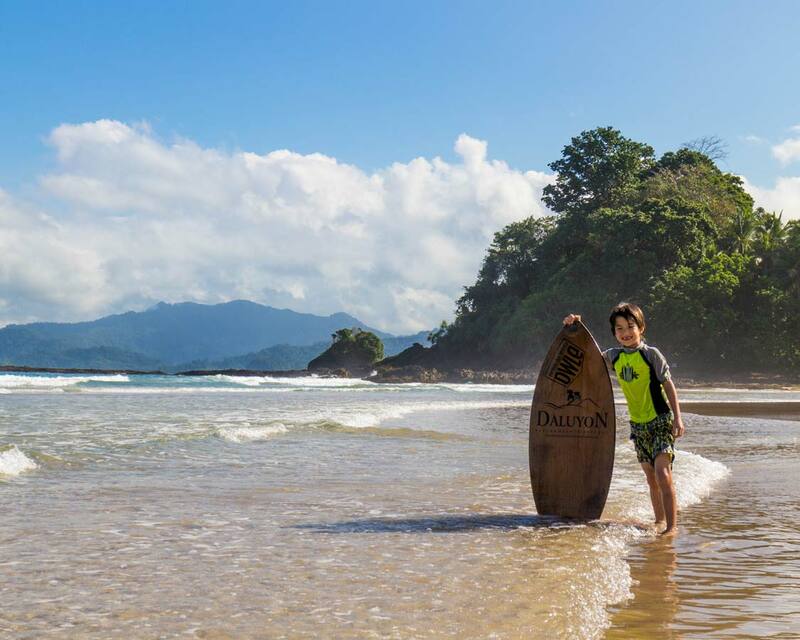 Family travelers to Palawan will love the quiet beach and chill atmosphere of Sabang. If you’re traveling to Palawan with kids, don’t miss the nighttime firefly tour. Kids will be amazed by the twinkling lights along the river’s edge. And be sure to swing over to Bakers Hill. This theme-style park is full of great play areas for kids. And true to its name, the Bakery makes some of the most delicious treats in Puerto Princesa. You can find all the details on how to get here and all the things to do in Puerto Princesa in our article here. Travel to El Nido is one of the most popular things to do in Palawan for families and solo travelers alike. 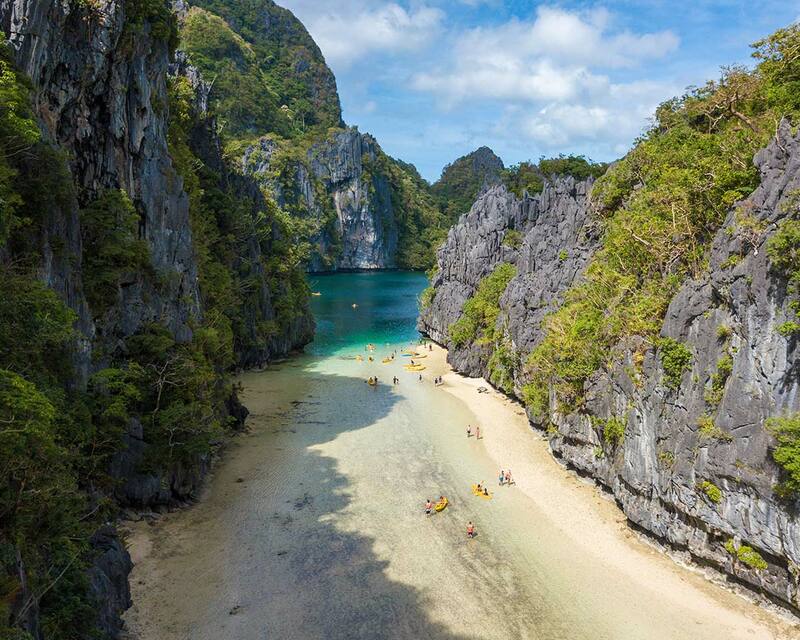 El Nido Palawan has been made famous by its dramatic karst mountains and island landscapes. 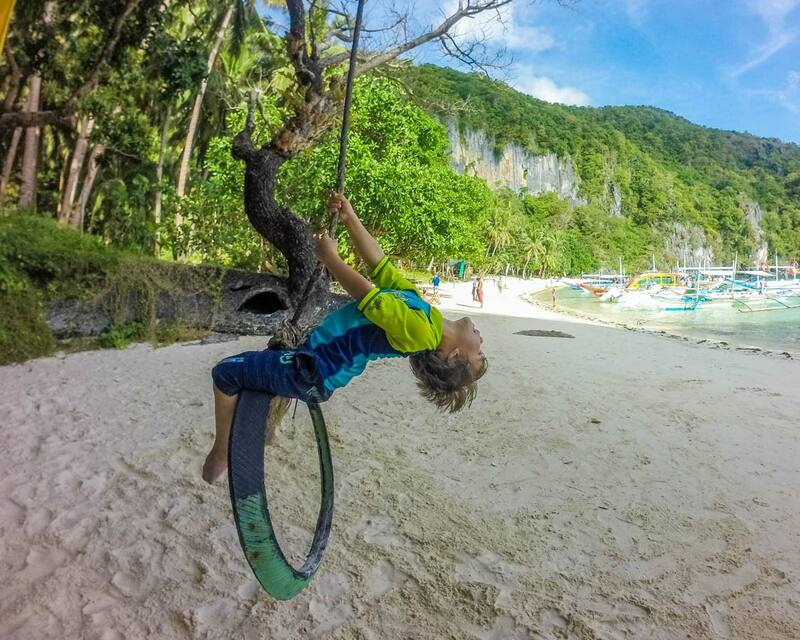 El Nido is the ultimate destination for most adventure-loving families in the Philippines, and once you set foot here, it’s not hard to know why. El Nido is about a 5-6-hour drive from Puerto Princesa or a 1.5 hours flight, but it’s a world away in terms of atmosphere. The streets of El Nido are bustling with expats and tourists coming back from a day out among the islands. El Nido is bursting with excellent restaurants, especially if you love seafood. But what really makes El Nido one of the best places to visit in Palawan are the El Nido island hopping adventures. With magical destinations like Secret Lagoon and Shimizu Island, El Nido offers a variety of amazing beaches, secluded islands, and unforgettable scenery. El Nido is perfect for those looking for something that feels off-the-beaten-path but has all the comforts of home. El Nido has a big expat vibe and is full of tourists. But El Nido is also a great place to get out and explore the islands. El Nido is also perfect for those who want to experience the most incredible islands in the Philippines in a short amount of time. The easy access to El Nido Marine Park means that you can easily hit one or two of the big island tours in a day. El Nido Private boat tours are perfect for families. 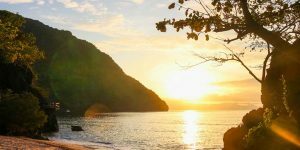 If you have a family of four or more you can easily get a private tour for the same price or less than if you were to join a group tour of El Nido. The hottest restaurant ticket in town is Altrove Pizza. It’s a great spot for kids, especially if you can snag one of the spots in the back that have floor seating with pillows. After a long day, young kids can doze off on the comfortable cushions while older kids will love the bohemian vibe. For something more unique head over to the Jarach’s grill in the fish market. They flame grill the seafood right in front of the restaurant. But grab a seat by the window, it can get very hot inside, especially when it’s busy. 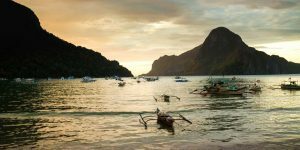 You can find all the details on how to get here and all the things to do in El Nido for families in our article here. Travel to Coron Island is for families looking for things to do in Palawan who want the beauty of El Nido but without the crowds. Coron Town is in the northern Palawan island of Busuanga. And although it’s closest to the rest of the Philippines, Coron can be a more complicated destination to reach. The island gets several flights a week from Manila and Puerto Princesa, however, service is less regular than flights to Puerto Princesa. Coron is a paradise for adventure-loving families in the Philippines. And the beauty in Coron isn’t just skin-deep. 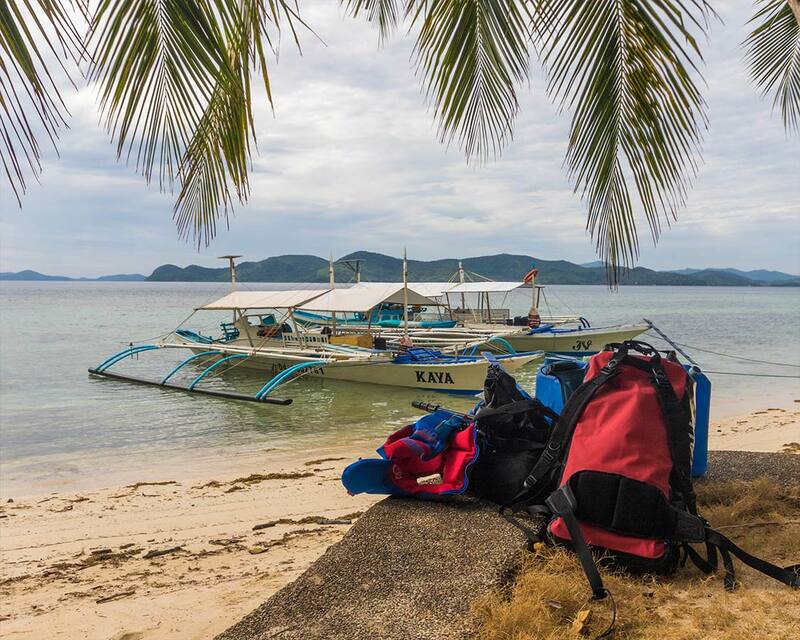 In fact, Coron offers some of the best snorkeling and SCUBA diving in the Philippines. Kids will go crazy over the varieties of fish that can be found just below the surface in even the shallowest of reefs. But it’s not just the water in Coron that makes travel here one of the best things to do in Palawan. The karst rock landscapes in Coron rival those of El Nido. There are incredible caves, serene lagoons, and beautiful swimming holes everywhere. 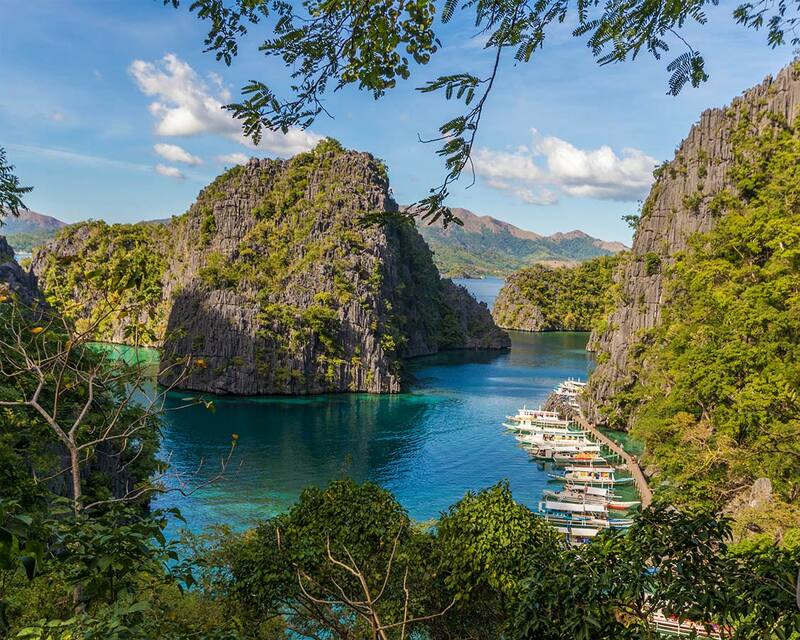 Coron island tours usually include stops at amazing destinations like the Twin Lagoons and Kayangan Lake. Coron Palawan is paradise at its finest. Quiet beaches, gorgeous scenery, and incredible food. Coron town is quiet and good for an afternoon stroll, but the real experiences in Coron lie along the coast. Take one of the Coron Island tours to experience some of the best water in the world. And make sure you include a tour that has lunch. The seafood dishes grilled up either on the boats or the islands are OH-mazing! 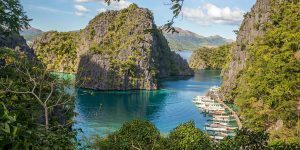 Like most things to do in Palawan Philippines, the tours in Coron aren’t “designed” with kids in mind. But being outside in the crystal clear waters and white sand beaches is heaven for most kids. When you combine that with the legendary Filipino hospitality, kids will experience some of the most hands-on treatment anywhere. If you’ve had enough of the water there are also great in-land tours in Coron that include experiences like the Calauit Safari Tour or head into Coron Town and hike up Mt. Tapyas to get some of the best views on Busuanga Island. For a truly special experience though, stay on one of the Calamanian Islands like Sangat Island. 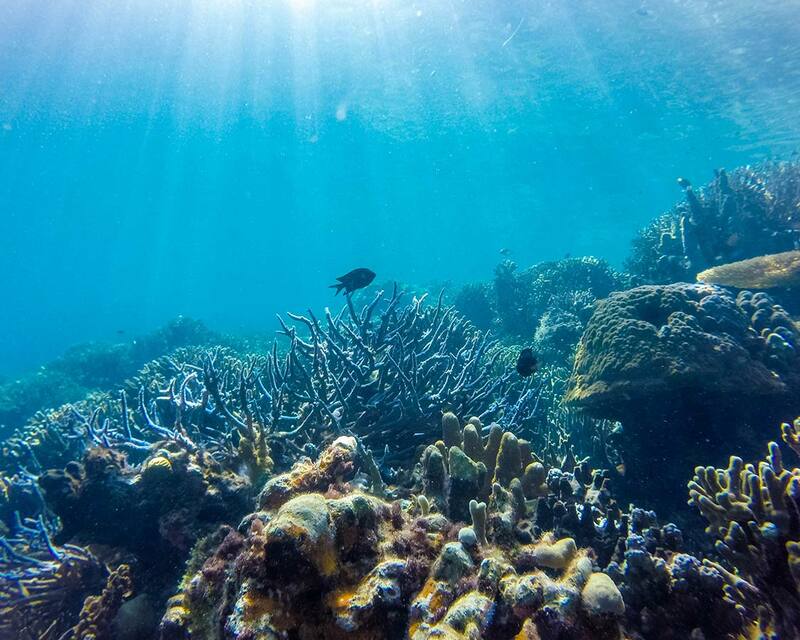 You can experience an even more remote experience and some of the best off-shore snorkeling in Palawan. You can read all about the best things to do and where to stay in Coron and the Calamanian Islands here. San Vincente Palawan is the best alternative to Boracay in Palawan. And in our opinion, San Vincente may be worth skipping Boracay altogether. The atmosphere of San Vicente is miles away from that of both El Nido and Coron. Gone are the towering karst mountains, replaced with small, quiet islands that are perfect for lazing around. San Vicente is full of quaint waterfalls and beautiful small towns. The slow pace of life here is a refreshing change from the more popular destinations in Palawan. We visited San Vicente with very little idea as to what the region had to offer, and our experience here became one of our favorite things to do in Palawan. Port Barton is the “urban center” for San Vicente. And even at it’s busiest, it is still far more laid back than El Nido or even Coron. Port Barton is a popular destination for backpackers and budget travelers. The beaches sprinkled throughout the region are incredible, and often, nearly empty. San Vicente runs at the perfect pace for families that want to slow down and enjoy the experience. Everything in the region seems positioned in just the perfect distance that you never have to rush to get there, but you’re never bored along the way. 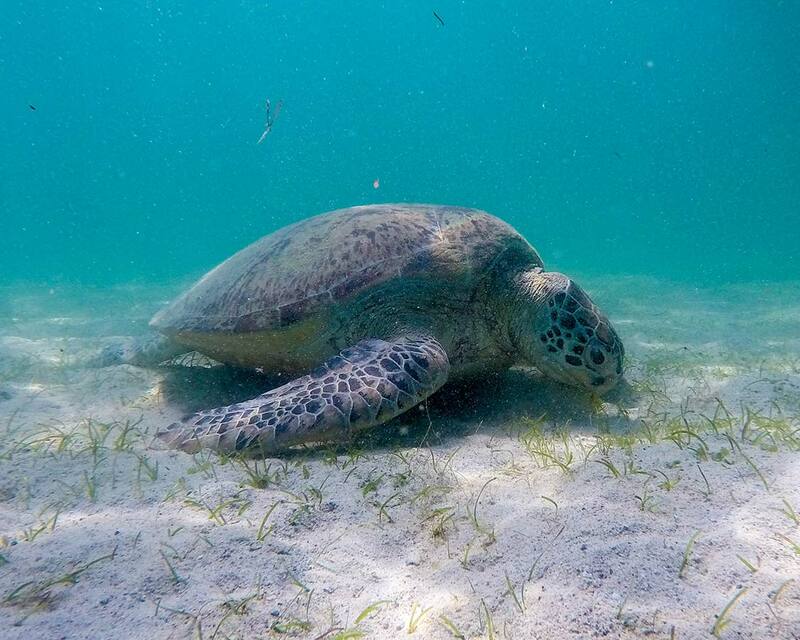 San Vicente is one of the best places in Palawan to swim with sea turtles. And the sandy sea bottom is a welcome feeling after the hard coral floor in the waters around El Nido and Coron. And we can’t forget about Long Beach in San Vicente, a 14-km stretch of (nearly all) white sand beach. It’s been touted as the longest white sand beach in the Philippines. Getting to San Vicente requires some navigation. You can either make the 4-hour road trip from Puerto Princesa (which can be broken up with stops in TayTay). If you’re coming from Coron however, you can make a quick 1-hour flight with Air Juan to the Port Barton airport. From there it’s a simple 45-minute trip across the water to San Vicente. You can read all about our experiences in San Vicente and Port Barton here. 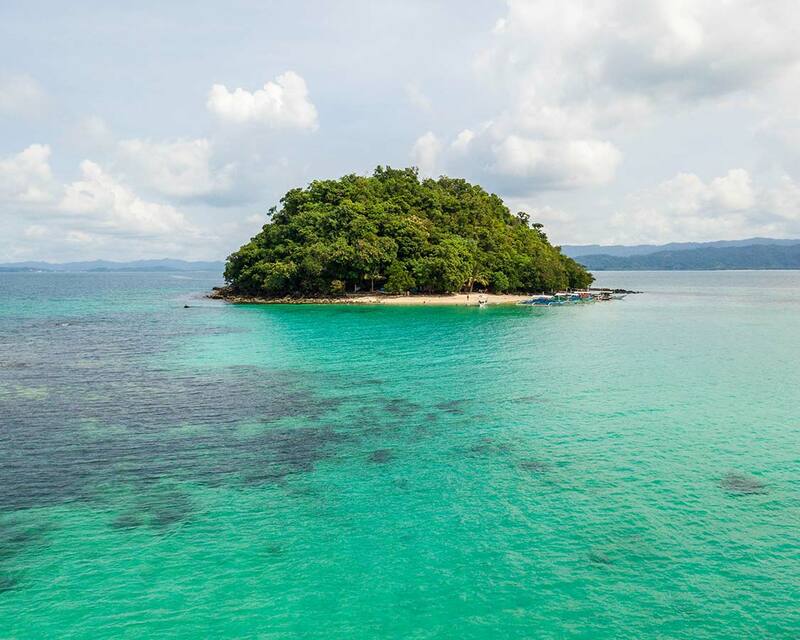 TayTay couldn’t be one of the best places to visit in Palawan without also offering island hopping though, and TayTay has it in spades. There are many islands off the shores of TayTay that remain untouched by tourism. For a city that is just 4-hours from Puerto Princesa, that’s quite a feat. If you want to experience the best things to do in Palawan without a crowd of tourists around you, Taytay may be the perfect place. While many visitors stop on the highway to take in the stunning views over the bay, they rarely make the trip into town. If you’re looking for a Palawan destination where you feel like you’re the only non-local than Taytay is the spot for you. If you are looking for a hotel in Taytay to break up your trip from El Nido to San Vicente, Flower Island Beach Resort is an excellent (and one of the few) choices for families. Travel to Quezon is where real off-the-beaten-path adventures in Palawan begin. Quezon is in the southern region of Palawan and is home to one of the most important archaeological sites in the Philippines. Tabon Caves has become one of the best things to do in Palawan since the Tabon Man was discovered here. Until recently, the fossilized remains of this man were the earliest known human remains in the Philippines. This changed when the Callao Man was discovered in Cagayan. 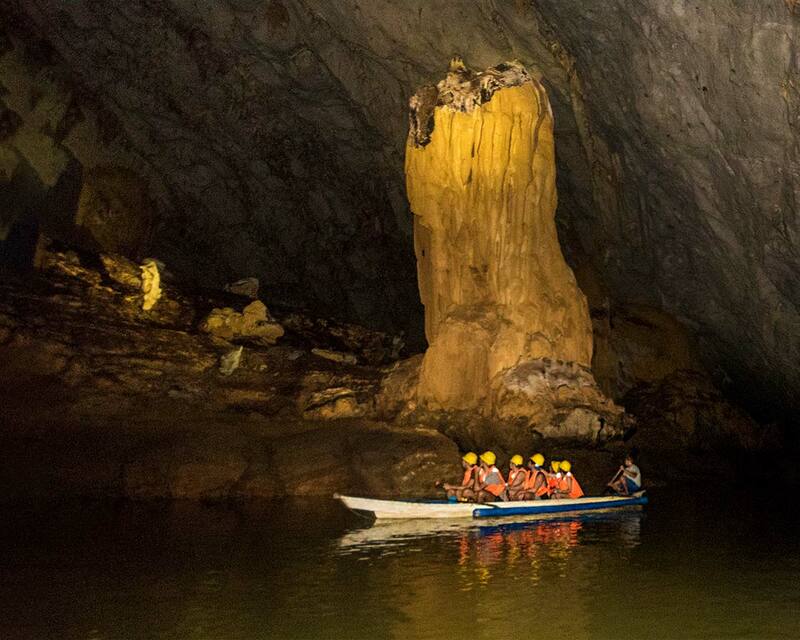 Tabon Cave is one of the best caves for experiencing amazing cave formations and archaeology. Getting to Quezon can be a challenge. It requires a 3-hour drive from Puerto Princesa and then a shuttle from San Jose to Quezon. To reach Tabacon Caves you must use a chartered pump boat. This last leg of the journey can take about 45-minutes. The last route includes a stop at the National Museum where you must get tickets. The Tabon Caves Complex has over 215 caves spread out across 138 hectares. Although, only 7 of the caves are open to the public. Quezon truly feels like the last-frontier in Palawan. If you love venturing off-the-beaten-path and including amazing caves, culture, and education into your family travel than Quezon is one of the best places. 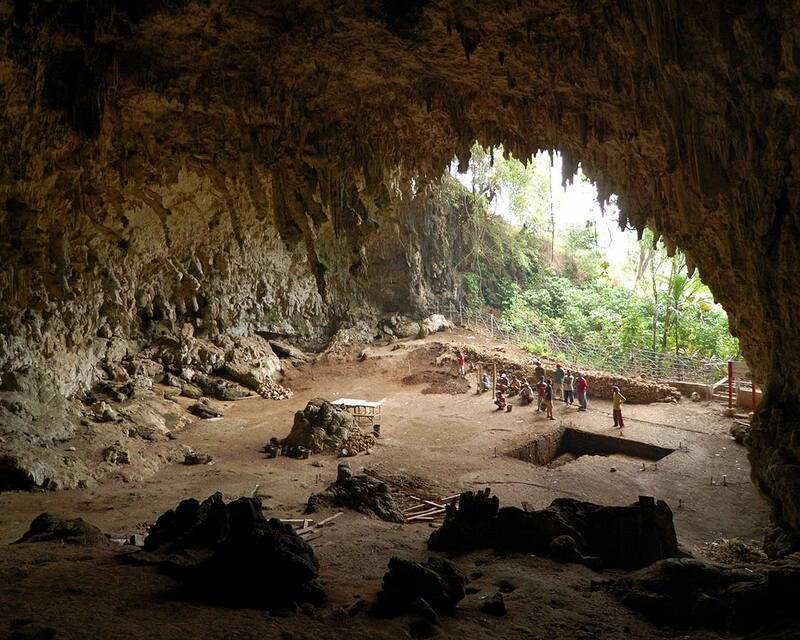 Kids will be fascinated at some of the archaeological facts of the Tabon Caves Complex. The Tabon Man has been dated back to over 16,500 years ago. But the oldest human bone in the cave has been dated back over 45,000 years! 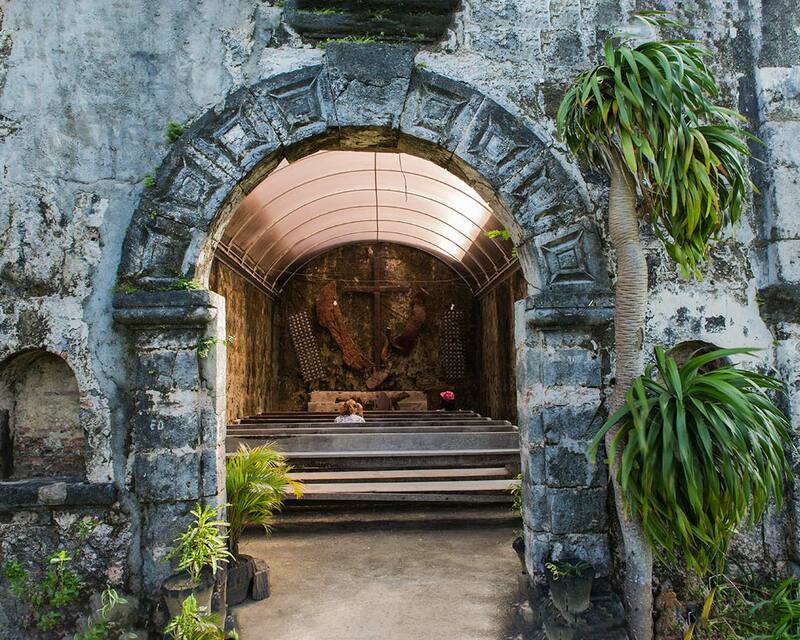 Quezon is the gateway to the Tabon Caves Complex. To get here, there are buses available between Puerto Princesa and Quezon. Although the town itself is quite small, the Tabon Village Resort offers nice cottage style accommodations for families. Tabon Seaview is also a good accommodation option for families. It’s a small guest house available for rental. The bottom of Palawan is Balabac. And it doesn’t get farther away from Manila than this. The southern coast of Balabac is nearly kissing Malaysia. Balabac is best known for its series of unspoiled islands surrounded by pristine waters and white sand beaches. If you don’t mind a long journey from Puerto Princesa, a visit to Balabac won’t disappoint. The journey from Puerto Princesa to Balabac takes about 9 hours. Half of this is by road through Palawan. The rest of the trip is from Rio Tuba to Balabac by boat. But is Balabac worth the effort? Yes. Balabac is one of the most pristine destinations in the Philippines. It’s home to pink sand beaches on Camiaran Island, incredible snorkeling at Nasubata Reef, and unforgettable views from Melville Lighthouse. Balabac is unspoiled and remote. If you’re looking for a family travel destination that is rough, authentic, and incredibly beautiful, Balabac is the right place for you. Don’t look for high-end resorts here (yet, I’m sure they are coming in a few years). Expect rustic accommodations, limited, if any internet, and services. There are very limited services in Balabac. This includes things like ATMs. Bring any money you feel you may need during your time in Balabac (and probably a little more). Balabac is much safer than many areas in the southern Philippines, there is a mixed Christian/Muslim population that gets along well, however, there has been a history of political issues here so it’s always a good idea to keep alert to the news before you travel. Malaria is also a concern in Balabac. It’s not present in all of the Balabac Islands, however, it shouldn’t be taken lightly. Ensure you speak to your doctor before you travel here and are prepared with Malaria medication before you travel to the region, especially if you are traveling with children. The region of Palawan is composed of many islands. So, when planning your family’s Palawan itinerary, you must make sure to leave enough time for travel between the islands. While there are regular ferry services in places like El Nido and Puerto Princesa, the further you get from the urban areas, the more inconsistent the Palawan travel options are. 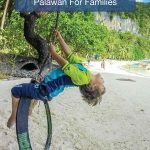 If you plan to experience the best things to do in Palawan with kids there are a few things you should remember to pack. 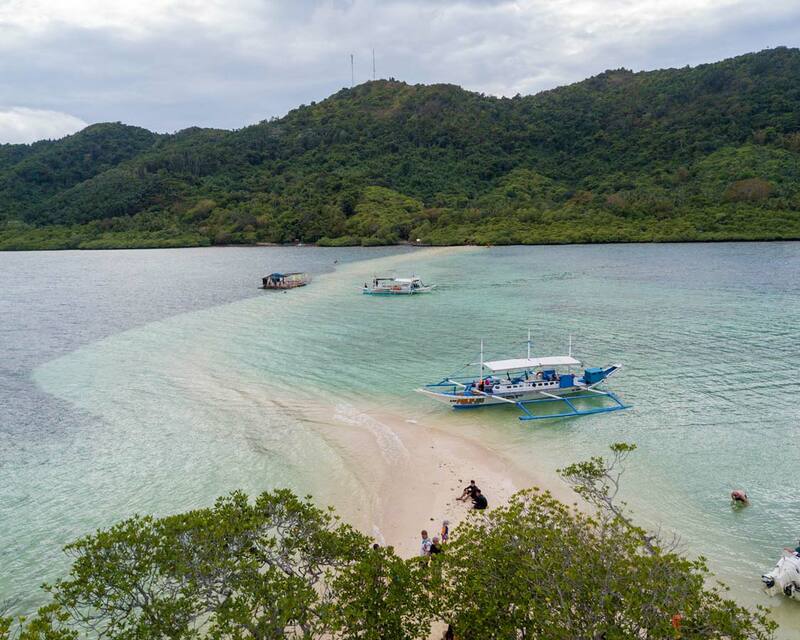 While most of the beach destinations in the Philippines will have the key essentials you need for having a safe and comfortable trip to Palawan, you’ll find that the more remote destinations have significantly reduced services. Here are a few things to pack for travel to Palawan. Children’s life jackets. – As I mentioned before, most tour companies in the Philippines do not stock life jackets for young children. We highly recommend bringing a children’s life jacket with you. Sunscreen and a hat – Lots of outdoor fun mean lots of sunshine. Protect yourself with high SPF sunscreen and a wide-brimmed hat. Dry Bag – Any time out on the water means that there is a chance your gear can get wet. Bringing a quality dry bag will help keep your clothes and equipment from getting soaked in the salty water. You can get large dry bags to fit or replace your luggage or backpacks and small ones to fit your cameras and phones. Filtered Water Bottles – Access to clean drinking water is available in most places within the Philippines. But constantly using plastic water bottles isn’t a great way to say thank you to nature for giving you all these incredible experiences. A filtered water bottle will let you drink tap water without risking stomach illness. Portable Power Bank – Remote travel sometimes means inconsistent access to electricity. A portable power bank is a great option to help keep your camera and phone charged so that you can capture those amazing family travel moments. I love this one since it holds a big charge and is also shock and waterproof. It also has a small solar panel so you can charge it on those long, sunny boat rides. Palawan is a two-season destination. The Dry Season in Palawan is from December to May. The coolest months are from December to February and the hottest months in Palawan are from March to May. The Rainy Season in Palawan is considered the low season. It runs from June to November with typhoon season generally occurring between July to October. Taking the baby to Palawan is never a bad idea 🙂 Happy travels. These images are eye-popping guys. So many movie backgrounds are filmed in this region of the Philippines I imagine…or in a similar area LOL. Love it. Excellent post K and C.
So glad we could help! 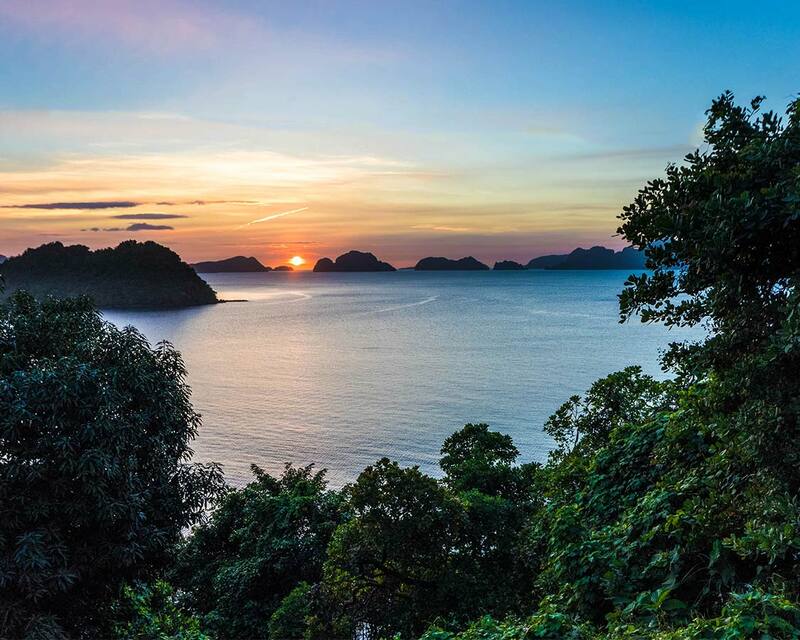 You won’t regret a moment in Palawan. I need to definitely put Philippines on my travel bucket list. Thanks for inspiring me to travel there. It’s one of our favorite destinations for family travel! I do hope things work out for you. It’s a country not to be missed. One word – amazing! Do you think a visit is possible with 8-9 days (from Melbourne)? Or would that be too rushed?? Hi Amber, Absolutely you can visit Palawan with that kind of timeline. Depending on the schedule you like, you may need to pick and choose your ultimate destinations in the region, but you can surely visit a number of amazing places. Hello, how old were your kids when you went there? Did you do any hiking/trekking? We have a 5 year old girl. 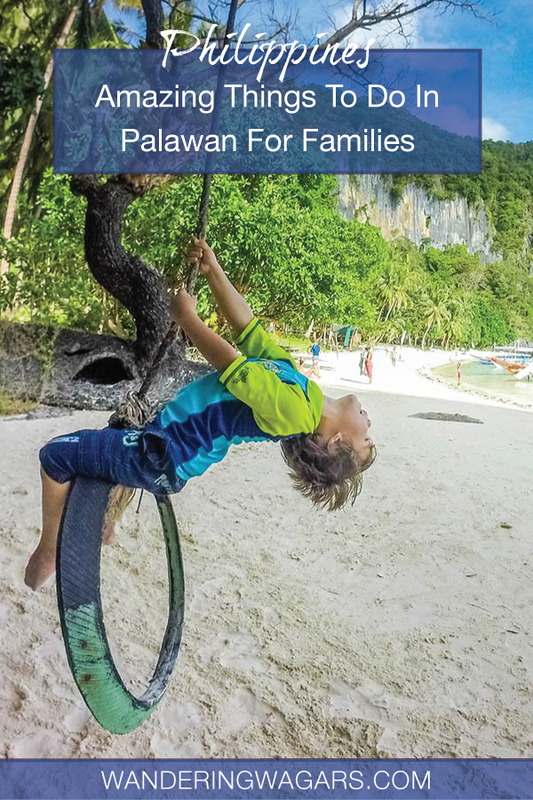 We are hearing that Palawan is not as family friendly as Bohol for instance. When we went to Palawan our children were 4 and 6-years-old. We definitely found it to be family friendly. The people were wonderful and the activities were exciting, engaging, and fun. We didn’t do too much hiking during our time apart from our cave exploring. Partly because we were focused so much on water activities while we were there.